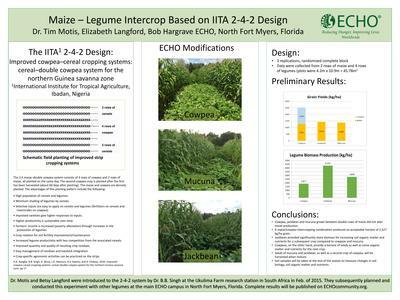 The 2:4 maize–double cowpea system consists of 4 rows of cowpea and 2 rows of maize, all planted on the same day. The second cowpea crop is planted after the first has been harvested (about 60 days after planting).1 The maize and cowpea are densely planted. The objective of this trial is to gain first-hand experience while evaluating the feasibility of implementing 2-4-2 with other legumes. This poster describes design and provides priliminary data from the first year (2015).